My daughter, Lelia, could have knocked me over with a feather recently when she informed me that she was interested in history. More precisely, she is interested in the American Civil War. Hoorah! She is going to school in Carbondale, IL and I said to her: "You know, Lelia, that your are living within a 2-hour drive of one of the most important battles of the Civil War. 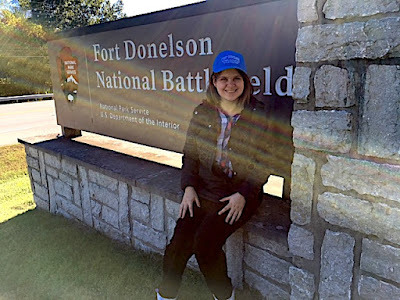 It's called Fort Donelson." Lelia was excited to hear that and she asked if we could visit the site, just Dad and Daughter, the next time that I was visiting her in Carbondale. 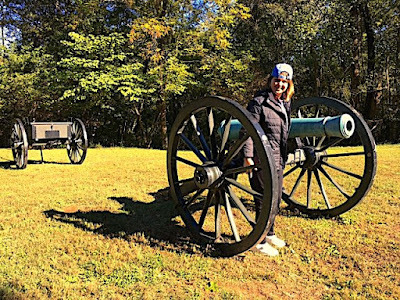 So we were visiting her on Parents' Weekend on the weekend of October 20, 2018 and I made arrangements to rent a car and drive to the battlefield on Sunday the 21st. With a drive of about 2.5 hours one-way, we had a lot of time to catch up on things and have some lively discussions and debates about the state of the world today. That is priceless, as they say. When we arrived at the battlefield the first thing that we did was to stop in at the visitors' center so that Lelia could get a good background and overview of the battle and of General Grant's 1862 Campaign. 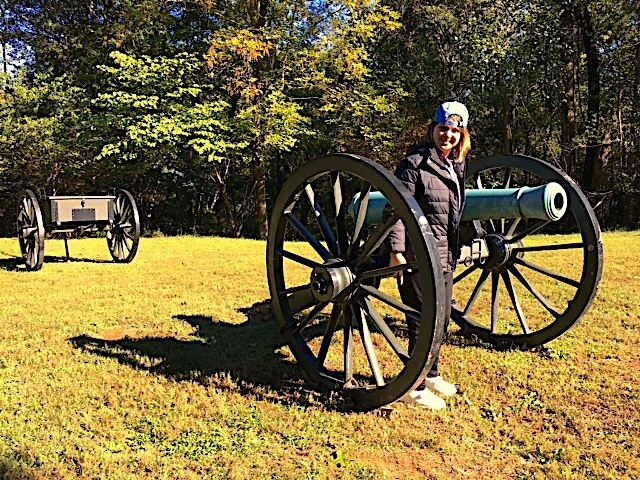 We talked to one of the park rangers and he was envious that I had a daughter who was interested in Civil War history. "I hope that my kids will like the Civil War too," he said. So we did the driving tour of the battlefield, stopping and getting out of the car at various places along the route. We got to see some very well preserved entrenchments and quite a good collection of artillery pieces. Lelia's favorite spot in the park was the view of the Cumberland River at the Lower Battery. I explained how Captain Foote tried to pass his flotilla of ironclad gunboats by the fort and reduce it with artillery fire at close range. 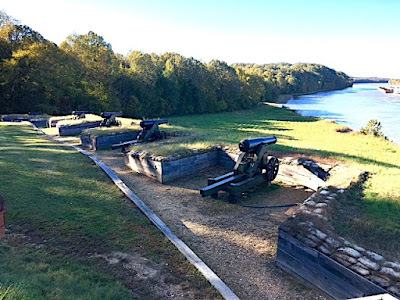 This tactic had worked at nearby Fort Henry (which guarded the Tennessee River), but not so much at Fort Donelson. The battery of ten giant 30-pound Columbiad fortress guns pounded Foote's flotilla so hard that they had to turn around and retreat. The lower river battery overlooking the Cumberland River. in the same manner as used to capture nearby Fort Henry. I think that this is a 20-pound Parrot. A view of the 30-pound Columbiad fortress cannon in the battery overlooking the Cumberland River. I have visited the battlefield three times now and I had yet to see the Dover Hotel, where Confederate General Simon Bolivar Buckner surrender his army of 13,000 to Union general Ulysses Simpson Grant. When Buckner asked Grant what the terms of surrender would be Grant replied,"I have nothing to offer but complete and unconditional surrender of your forces." Grant made it clear that if Buckner did not surrender, that he (Grant) was prepared to assault the fort with his army within the hour. Buckner accepted the terms. Since Grant's initials were U.S. Grant, the Northern press took to calling him "Unconditional Surrender Grant." It was late in the afternoon by the time we reached the Dover Hotel and discovered that it closed at 4PM. We arrived there at 4:15PM. So I have still not seen the hotel, at least from the inside, but I was able to view it from the outside. 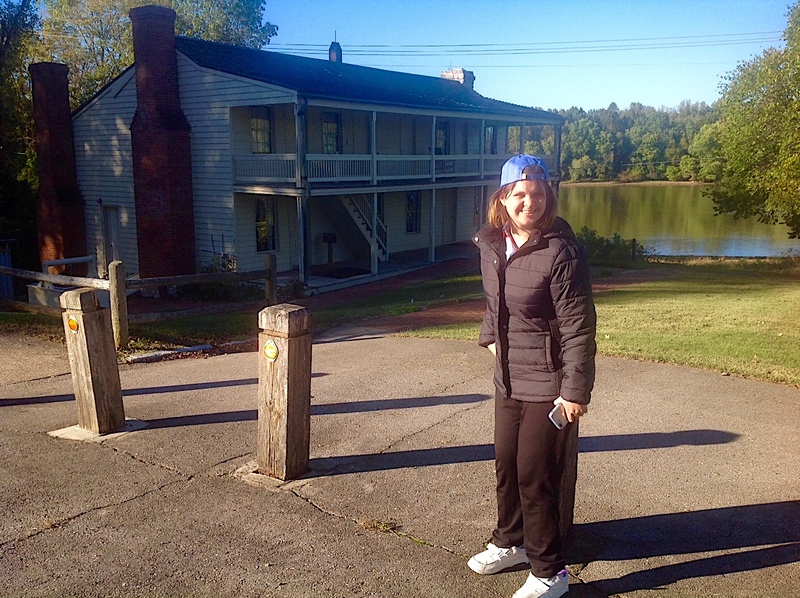 Lelia at the Dover Hotel, where General Simon Bolivar Buckner surrendered to Unconditional Surrender Grant. 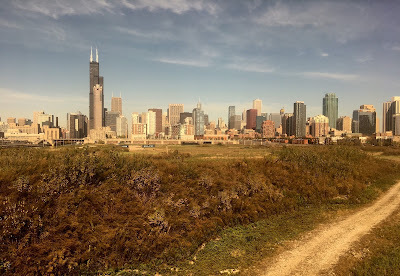 The following Monday, we took the Amtrack train from Carbondale to Chicago and returned home. Lelia had developed a case of bronchitis and so her school recommended that she go home with us and get well for a week. On the way home on the Amtrack train. I have now taken the train on this route three times and I still am in awe of the sight of the Chicago skyline as the train rolls towards the final stop at Union Station. Home is in sight - the impressive Chicago skyline from the south of the city. We both had a great time on our first battlefield visit. I told Lelia that Fort Donelson was the very first Civil War battlefield that I visited with my father. So history seems to be going in full circle. She wants to see more battlefields with me, and soon. Given Carbondale's proximity to Franklin and Shiloh, I would imagine that one or both of those sites will be the location of our next battlefield tour. I can't wait! I am always impressed with the way the USA remembers its Civil War battlefields! I do hope Lelia is feeling top form again very quickly! Awesome Jim! You're a lucky man! A brilliant posting, Jim. Such occasions are a priceless piece of parenthood. As Lelia's historical interest blossoms I'm sure there will be gentle suggestions about seeing AWI battlefields, too! :-D Best wishes to you & to Lelia for a speedy recovery. Cheers, Rohan. Lucky Man Jim - to have a daughter like this and to live in a country that respects its battlefields so well for visitors. I have enjoyed many of them over the years. It is VERY encouraging to see young people take an interest in history! I hope that she is feeling better now. What a lucky fellow... to be able to guide her progress in an area that offers such rich rewards! Great to hear of the next generation’s interest. I hope Lelia’s bronchitis gets better soon. Thank you all for the kind comments. Lelia has recovered from her bronchitis and is back at school writing a research paper on Evolution versus the Judeo-Christian Creativity Story. Yikes!